I am a big fan of music. I don’t hide this from anyone who takes the time to get to know me. I am open about what I listen to and am willing to give anything a try. Life’s too chaotic to not enjoy music you listen to. I like bands like The Rolling Stones, The Beatles, Brad Paisley, Garth Brooks, Katy Perry, The Bad Joke That Ended Well (never heard of em? Check the archives) and even Justin Beiber (Shut It. His music has some good beats, and let’s face it, he has millions of girls screaming his name. When’s the last time YOU had that?). I like Rock, Rap, Country, Christian, boy bands, angry chick rockers and really confused artists that dress up in freshly cut sides of beef. I am constantly searching for the next big thing. Not to sign them or sell them, that ain’t my job. But the next big artist that gets me excited to push play on my iPod. 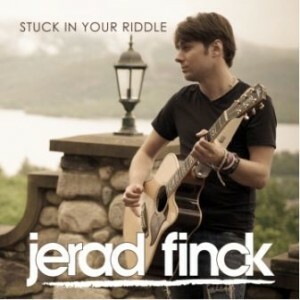 I have to say, this week, what’s got me wanting any excuse to power up is Stuck In Your Riddle by Spokane native Jerad Finck. Seven tracks and all it took was the first run through of “Won’t Give Up” for me to realize that I had a great album on my hands. I listened to the track three times before I moved on to the rest of the album and felt, well, awesome. Not one to jump to conclusions without giving the rest of the project my attention, I ran through the rest of the tracks, and from the love song, “Won’t Give Up,” to the lighter “Stuck in Your Riddle,”straight on through “Beautiful,” “Can’t Stop”and ending with “Runaway,” I am impressed. Catchy lyrics are paired with great instrumentals that really move you with the vibe of the song. What I find great about this album is it is not pretentious. Each song has something different to offer that when combined into one project, really shines. The whole album is light and upbeat and won’t make you feel pissed off or like going out and getting smashed. Even better, track 6 and 7 are two different remix’s of “Runaway,” and both of which I wouldn’t be surprised to hear in a NYC dance club or on some DJ’s late night dance remix list.